June 12, 2013 by rwb, under Microcontroller. Communicate with a standard I2C protocol to the any smart controller (e.g. 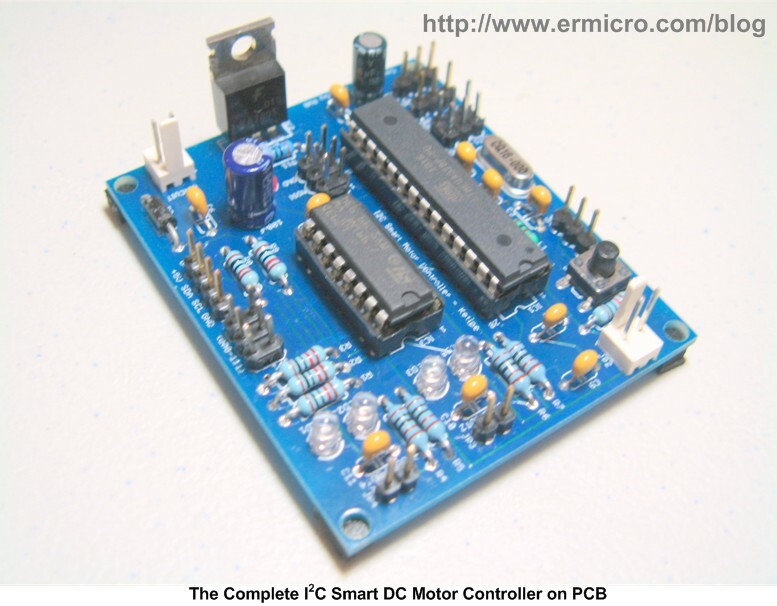 microcontroller based board or microprocessor based board) that supports I2C protocol. 5 Alkaline AA battery (7.5 volt) or two 18650 3.7volt Rechargeable Lithium battery (7.4 volt), or any adequate 7.5 volt regulated DC power source. The I2C bus use only 2 bidirectional data lines called SDA (serial data) and SCL (serial clock) for communicating between the main microcontroller called “Master” and co-microcontroller called “Slave”. The I2C protocol specification can support up to 128 slave devices attached to the same bus which is one of its the main advantages. The master I2C controller is responsible to initiate any communication between the I2C master device and the I2C slave device. Each of these I2C slave devices has their own 7-bit individual address which consists of fixed 4-bit device identification and configurable 3-bit physical address. These individual slave addresses allow the master controller to communicate to each of the slave devices attached to the I2C bus. You could read more about the I2C in these articles “How to use I2C-bus on the Atmel AVR Microcontroller” and “Transforming your AVR Microcontroller to the I2C (TWI) Slave I/O Expander Devices Project”. The I2C master controller first will send the “start” condition to the I2C bus; this will trigger the attention to the entire I2C slave devices attached to the same bus. Next the I2C master controller will send the particular I2C slave address with write instruction, in our case the I2C smart DC motor controller has the 4-bit fixed address of “1000” and configurable 3-bit address of “111”, therefore the I2C slave device will send the “acknowledge” to the I2C master controlled. Next the I2C master will send the first 8-bit data (i.e. register address) and the second 8-bit data (i.e. register data) before sending the “stop” condition. The following is the first version of our firmware which implements these features written in AVR GCC language. Now all the I2C master request to the I2C slave will be handled by interrupt in the ISR(TWI_vect) function where the request to the I2C slave and response from the I2C slave will be read or assigned to the TWDR (Two Wire Interface Data Register). Therefore by interpreting the “predetermined” data (protocols) send from the I2C master, the I2C slave device could easily be programmed to behave as instructed e.g. turn on the DC motor, steering the wheel, controlling the motor speed, etc as implemented in the ControlAction() function. The motor steering is controlled by the SGS L293D four channel motor drivers which capable of driving 600mA continue current on each channel. The L293D chip has equipped with a flying diode on each channel which simplified the overall electronic schematic design. By configuring two of the L293D channels as the H-Bridge circuit driver to each of the DC Motor, we could easily control the two DC motor rotation direction and speed as shown in this following picture. The L293D chip IN1 to IN4 input terminal is connected to the AVR ATmega168P microcontroller PD4 to PD7 output port, while the L293D four channel ENABLE1 and ENABLE2 input are connected to the AVR ATmega168P microcontroller 16-bit TIMER2 PWM output channel OC1A and OC1B. The DC motor differential steering is controlled by applying the correct output logic (see the L293D truth table above) to the PD4 to PD7 output on PORTD which is implemented in the MotorDirection() function. By supplying the PWM (Pulse Width Modulation) signal on each of the L293D chip ENABLE input we could control the power on each DC Motor. The AVR ATmega168 microcontroller 16-bit TIMER1 is choosed as the DC motor PWM source and is configured as the Phase and Frequency Correct PWM mode, we choose this mode as later on we will implement a flexible configurable PWM frequency in the I2C smart DC motor Controller firmware. You could read more about AVR PWM in these articles “Introduction to AVR Microcontroller Pulse Width Modulation (PWM)”, “AVR Twinkle Twinkle Using PWM Project” and “Working with Atmel AVR Microcontroller Basic Pulse Width Modulation (PWM) Peripheral”. 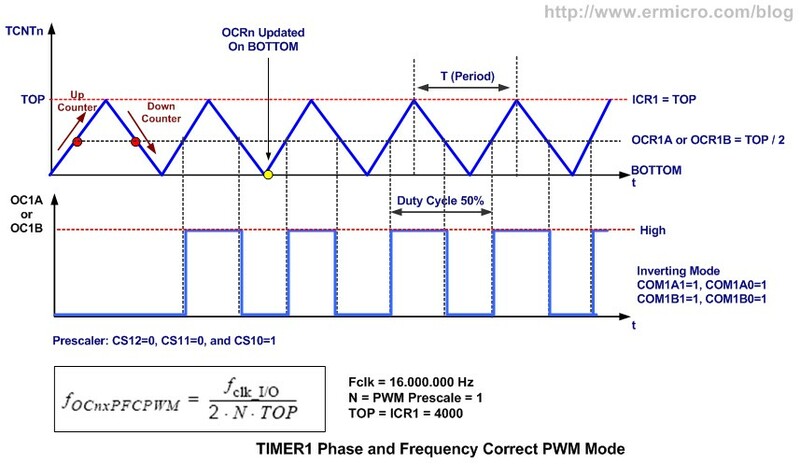 The TIMER1 Phase and Frequency Correct PWM mode used a dual slope counter operation in order to generate the PWM signal. First the 16-bit TIMER1 counter TCNT1 will count up, when the TCNT1 reach the OCR1A or OCR1B (Output Compare Register) value then the TIMER1 pheripheral will set the OC1A or OC1B output to a logical one. When the TCNT1 reach its maximum value (TOP) set in ICR1 (Input Capture Register) value, then the TCNT1 will start to count down, when it reach the OCR1A or OCR1B value the TIMER1 pheripheral will reset the OC1A or OC1B output to a logical zero as shown in this following picture. With the frequency clock of 16.000.000 Hz, prescaler (n) of 1 and TOP value of 4000 (pwm_top variable), the PWM frequency is 2000 Hz. Where pwm_top and pwm_duty variables are fixed value of 4000 and 40, while the pwm_a or pwm_b variable value represent the PWM output duty cycle from 0 to 100, therefore by setting the pwm_a or pwm_b to 100 the OCR1A or OCR1B value is 0 (100% PWM duty cycle) or when pwm_a or pwm_b is set to 0 the OCR1A or OCR1B value is 4000 (0% PWM duty cycle). 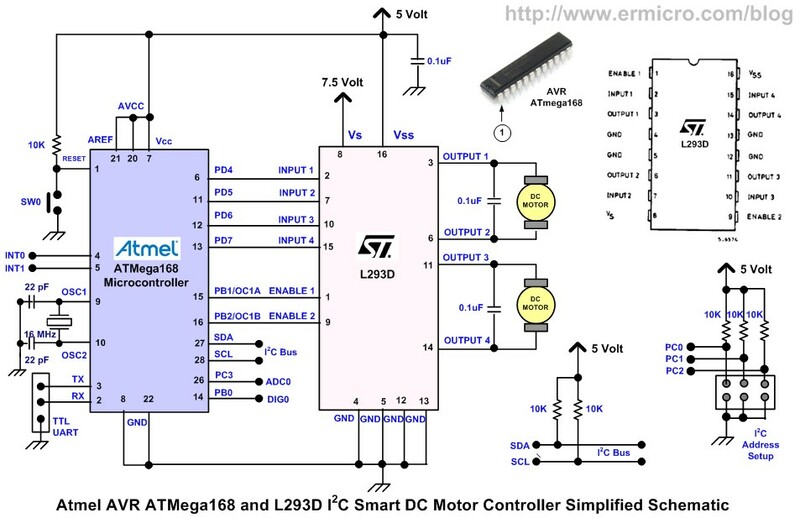 The DC Motor speed control is implemented in MotorPower() and MotorPWM() functions. One of the important feature implemented in this project is the runtime debugging which is implemented using the Atmel AVR ATmega168 microcontroller UART peripheral. This runtime debugging will help us to capture and examine program variables value on the terminal such as window Hyperterminal or PuTTY program (i.e. baud rate: 19200, data bit: 8, and stop bit: 1) while we run the code. In order to enable this debugging feature you could simply change the I2C_MCTL_DEBUG definition from 0 to 1 and connect the AVR UART port RXD (PD0) and TXD (PD1) to the UART to USB or UART to RS232 adapter to your personal computer. In order to test the first version of the I2C Smart DC Motor Controller firmware, I will use the Atmel AVR ATmega328P microcontroller with the AVRJazz 28PIN board. Where we simply connect the AVR ATmega328P TWI (two wire inteface) port SDA (PC4) and SCL (PC5) to the SDA and SCL port of the I2C Smart DC Motor Controler. The following is a complete C code where the AVR ATmega328P microcontroller is configured as the I2C master controller. 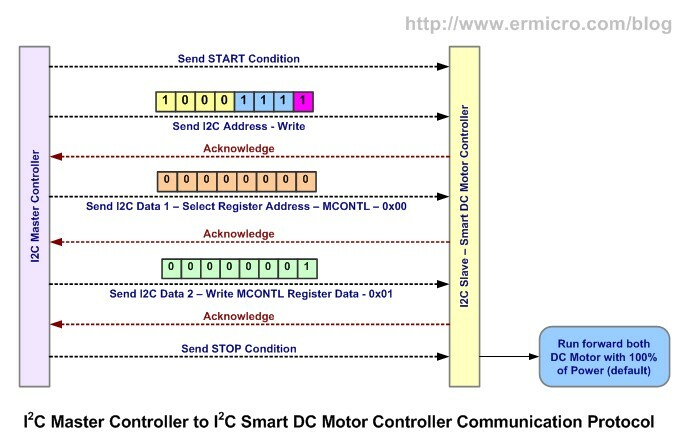 The first command we assigned the MPOWER (0x04) register in the I2C Smart DC Motor Control to 65. This command will be interpreted by the I2C Smart DC Motor Control firmware as to generate 65% duty cycle for both the DC motors. The second command we assigned the MCONTL (0x00) register in the I2C Smart DC Motor Control to 0b00000110 (0x05). 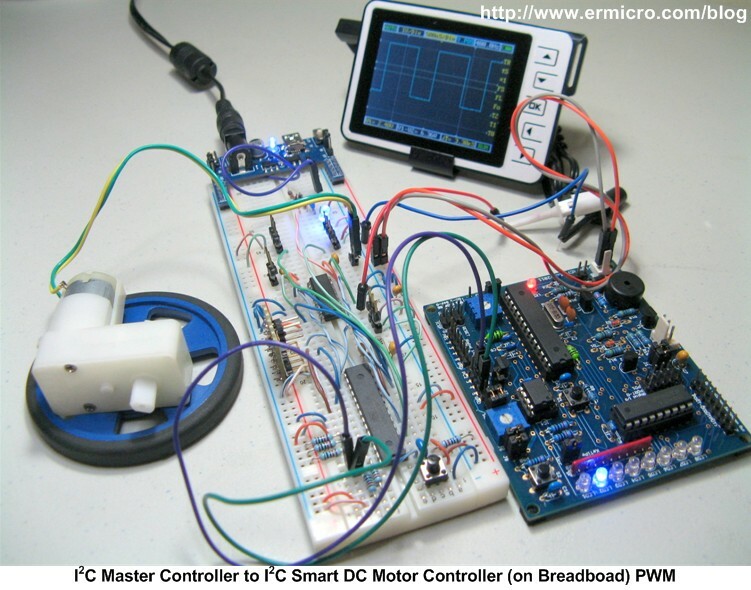 This command will be interpreted by the I2C Smart DC Motor Control firmware as to rotate left (i.e. steering function). You could use similar principle to other commands as shown on the demo C code above. Using the I2C protocol is one of the embedded system solutions to use a multi-microcontroller to solve a complex embedded system tasks. 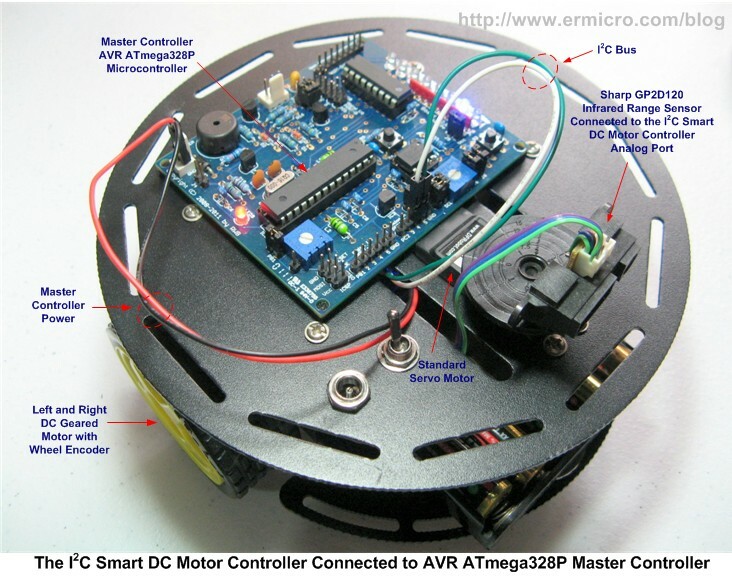 In this project we’ve learned to separate the DC motor control tasks in the Atmel AVR ATmega168 microcontroller and use its sister the Atmel AVR ATmega328P microcontroller as the main controller. 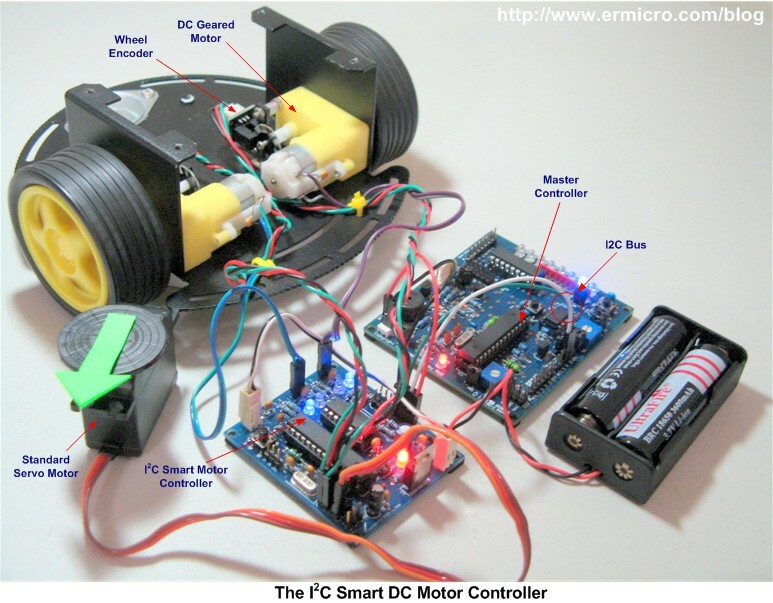 In the part 2 of the project, I will add more features to the I2C Smart DC Motor Controller firmware and use different microcontroller type as the I2C master controller.